Regional heats have been held in all participating countries and the finalists below joined us on 20th November for the Grand Final which was held at Huizhou University, China. Huge congratulations to our winner Orla McCarthy, the Ireland finalist who took first place winning the prestigious Veronica Bell Trophy and £1000 cash prize. Well deserved runners up were Daniel Matthews from the University of Huddersfield (UK finalist) and Paradorn Katerat, (Thailand Finalist) from Rangsit University. The brief for the 2015 International Design Competition themed ‘Buy less, choose well’ is now available on our website and is open to undergraduate fashion/textile/design students around the world . Entry forms can be submitted from September 2014 .
innovative approach to incorporating this year’s theme of ‘Material World?’ within the original design and final application. The judges will assign marks in each of these four categories. In most instances, the students will be invited to bring their boards and statements to the regional heats. They will meet the judges and have the opportunity to give some background on their project. Where this is not possible alternative arrangements will be made. This year’s theme of ‘Material World’ must be included in the design and the written statement. Imagination is much quicker than technology! Innovation, creativity and originality are at the forefront of the textile industry, and are what is required to keep it alive. Ideas will always come first and then the machinery will help aid the initial concept into final fabric. The aim of this brief is to create a design that is both useable and has a function. 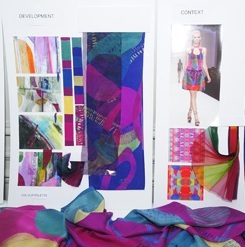 Living in a world where textiles surround us on a daily basis, it is important to push the boundaries of textile design in new directions for the future taking into consideration industry’s working methods and limitations. It is particularly important that you are aware of the environmental impact of your designs. Understanding different fibres and their qualities will enhance this process. Think about how sustainable your choice of yarn is or any other processes that are used to create the finished design. In other words, ask yourself the question: how sustainable is your overall process?! You need to consider all aspects of your product, how it would be made and its ultimate use. From February 2014 -regional heats have taken place and some country finalists have been announced. By September 2014- each participating country will have held its own heat and selected a finalist who will represent their country at the Grand Final. November 2014 – the Grand Final takes place at Huizhou University in China and the global winner will be announced. Age limit: Students must be aged not less than 18 years on 1 April 2013. Publicity: The work of the finalists will be on display during the heats and final. The winners will receive extensive publicity in the international press and in the Society’s own publications. Intellectual property: The intellectual property rights (patents, registered designs etc) in all designs submitted in the competition remain with the student. However, the Society reserves the right to use the designs for exhibition purposes and to reproduce them in reports, on the website, in press releases and in any other publicity material. Entry FormPlease download the file and complete in adobe reader. Opening within a web browser may prevent you filling out form fields.